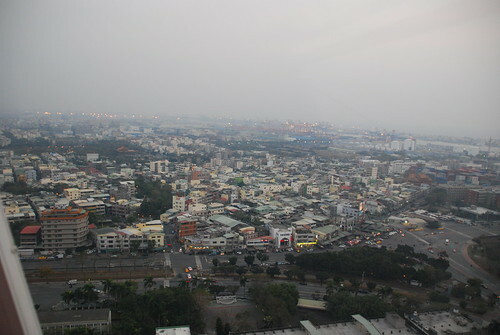 Hui-chen, her 2 sisters and I decided to finally walk over to the new Dream Mall in Kaohsiung and ride the ferris wheel on top of the building. 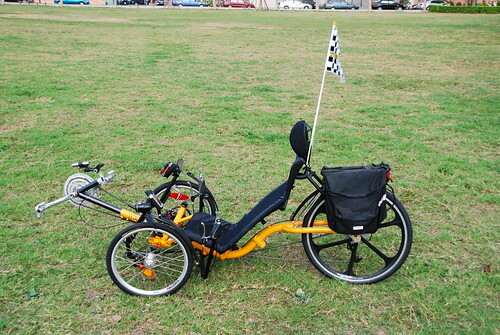 This article contains quite a few photos but there are even more on my Flickr photostream. Clicking on any photo will take you to the Flickr photo page. 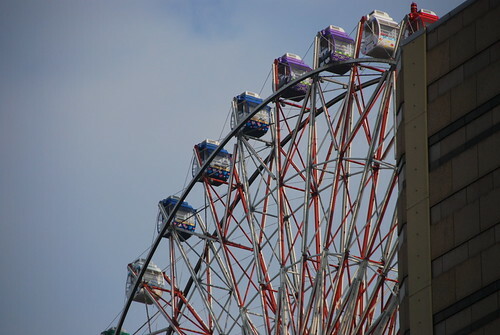 A closeup of the ferris wheel, taken from street level with the zoom lens. 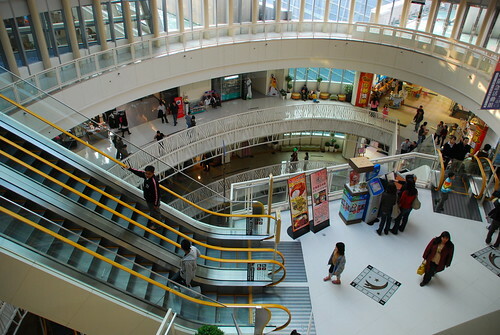 The Dream Mall is rather large inside and quite impressive. 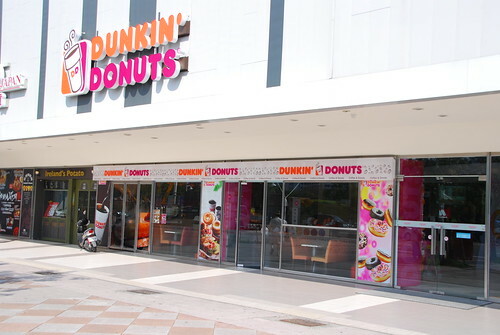 Also impressive is the number of stores and what you can find. On our trip to the mall, you sure couldn’t tell that there was any economic recession! 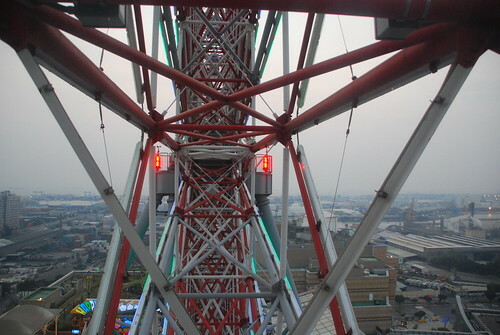 Taking the elevator or esclator to the top floor, you’re greeted with this view of the ferris wheel upon entering the roof area. 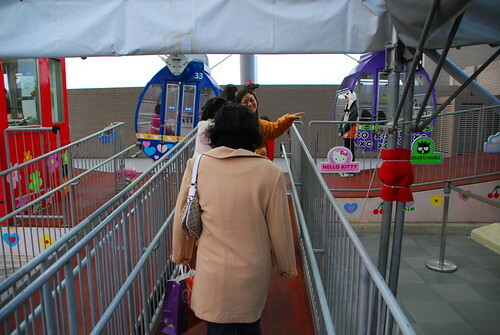 We bought our tickets to ride the ferris wheel and then took a walk around for a bit before boarding. 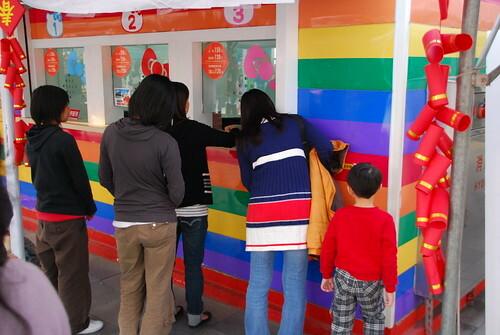 This shot was taken right in front of the ticket booth, looking up. The ferris wheel is quite impressive. 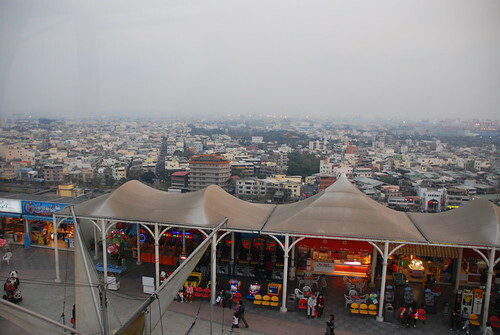 I was surprised to find the roof of the Dream Mall to be almost like a little city unto itself. plus a few things a little wilder for the bigger kids and adults. We ordered some food, but it was rather disappointing. 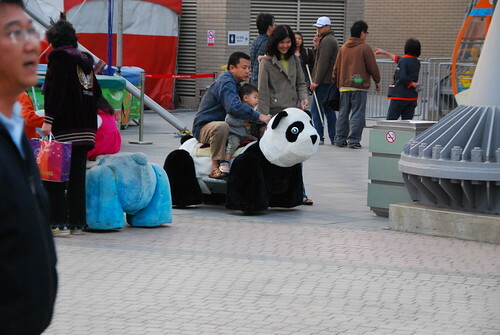 This guy was riding his son around on a motorized panda. Meanwhile, everything falls under the shadow (so to speak) of a very large ferris wheel overhead). It’s hard to appreciate until you’re right up close to it. 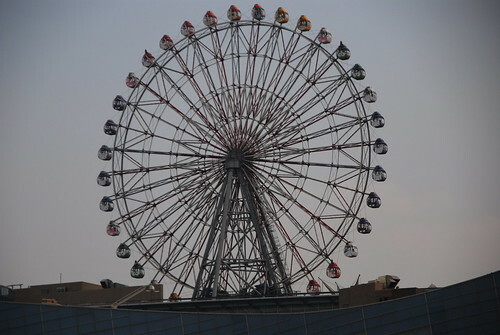 The ferris wheel sits on top of the mall building, and it’s so high in the air that it needs beacons for air-traffic safety purposes, as the Kaoshiung airport is nearby to the east. Several of the cars have beacons installed. I presume that when parked, they leave one of these cars up on the top. 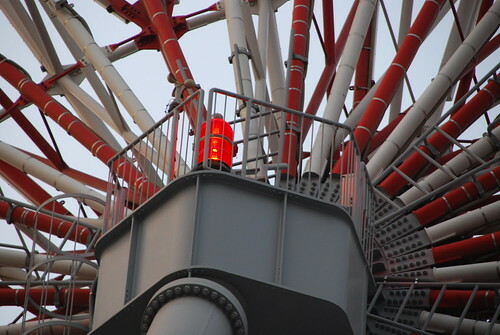 This is the central hub of the wheel. 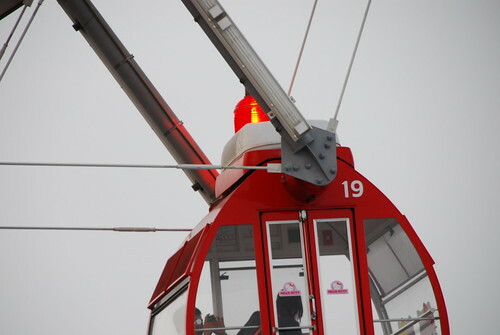 Notice the anemometer (which is a bit difficult to see to the left of the beacon and mounted on the rail). Another beacon on a car. Finally we were done messing around on the roof and decided to board the ferris wheel. 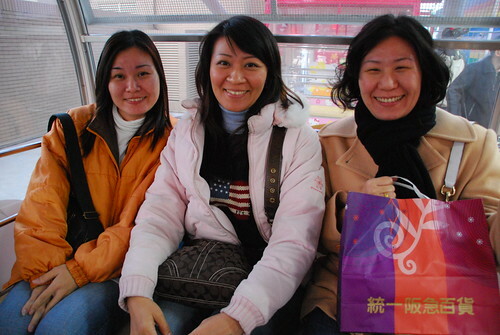 The 3 sisters (my lovely wife on the right). 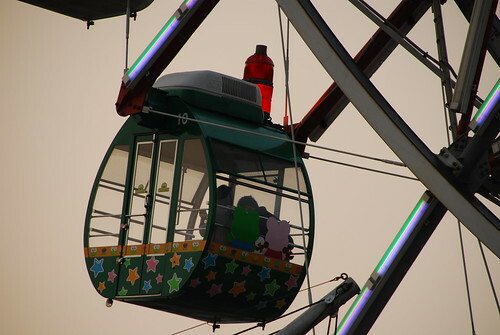 In each car there are some stuffed animal thingies that might come in handy if you are scared of heights. Hui-ling called Mom and told her to look out the window. 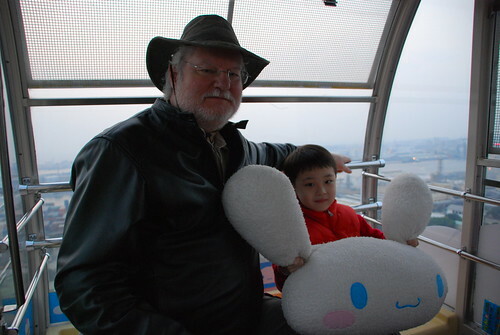 Uncle Mike with my buddy Shiang. Wow, everything looks so small from up here! This last shot is the hub of the wheel as we decend back to the loading station. The ferris wheel doesn’t stop so you have to hop off the moving car before you end up going around again. Be sure to leave a rating and let us know how you liked this article. 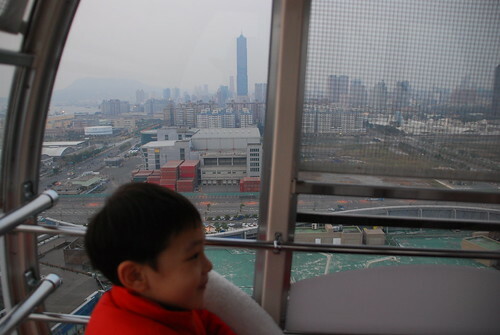 me and my girldfriend went on the ferris wheel during first week of january when we were still in our home town kaohsiung for our xmas new years break. 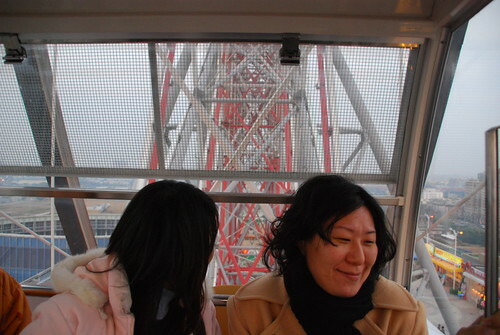 it was my gf’s first time ever going on a ferris wheel, i think it might have been my 2nd time although i cant remember where and when i been on one the first time, probably when i was tiny, either that or this was actually also my first time. i think there must be many ppl out there that’s not been on a ferris wheel ever despite the fact that they are not hard to find. 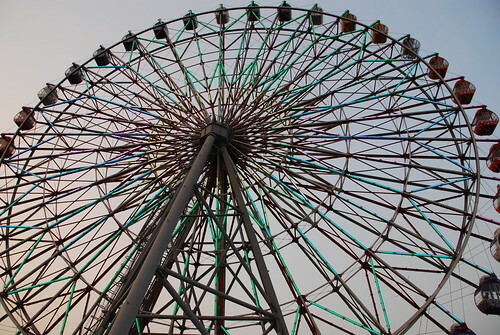 Dennis, please tell our readers how you liked going on the ferris wheel. my wife thought she would be scared but it really wasn’t bad at all. I’ve never been to this mall! 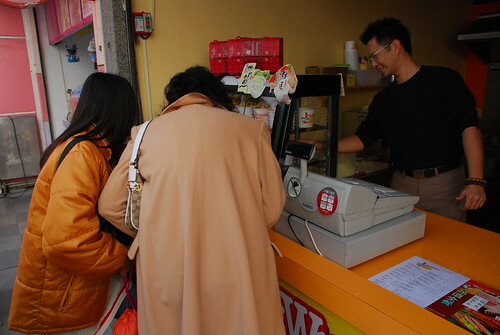 I’ll have to rectify this situation next time I’m in Taiwan. Hahaha. 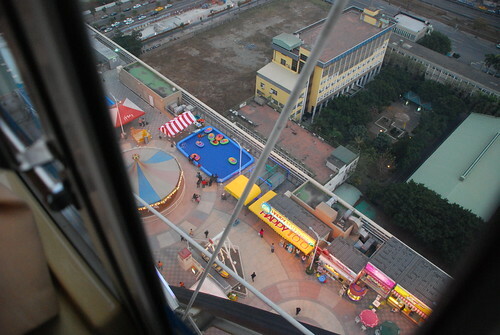 I’ve always thought it strange that Taiwanese department stores have amusement parks on their roofs. 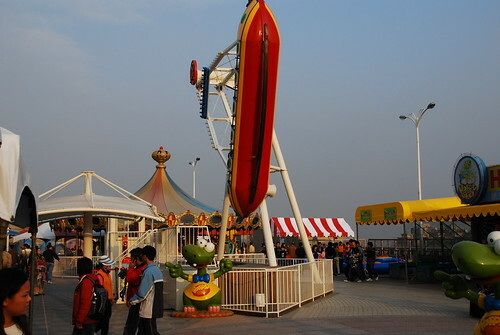 Some of the rides are terrifying simply because of the height. I’m really looking forward to the rest of this series! putting amusement parks on rooftops wouldn’t be my first idea either, Sandy. 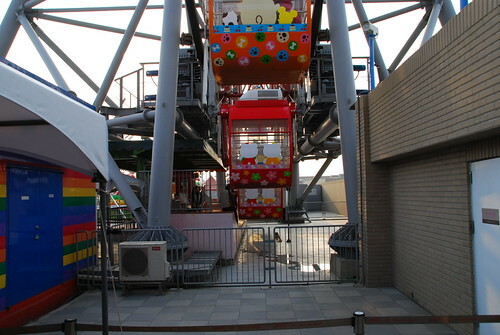 the ferris wheel is big enough but the added height of the mall building makes it even more scary for some people. 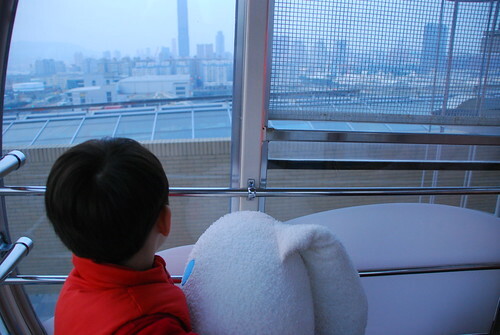 MJ, that is one giant ferris wheel for sure and then they have it on top of some freaking building lol. 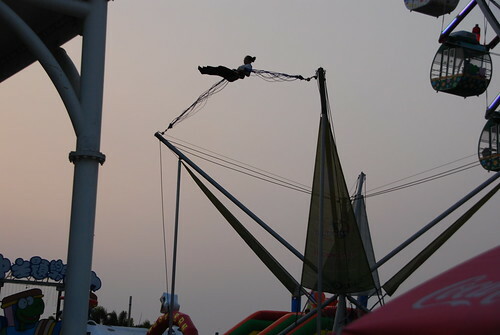 I am bit scared of heights but I might try this one. 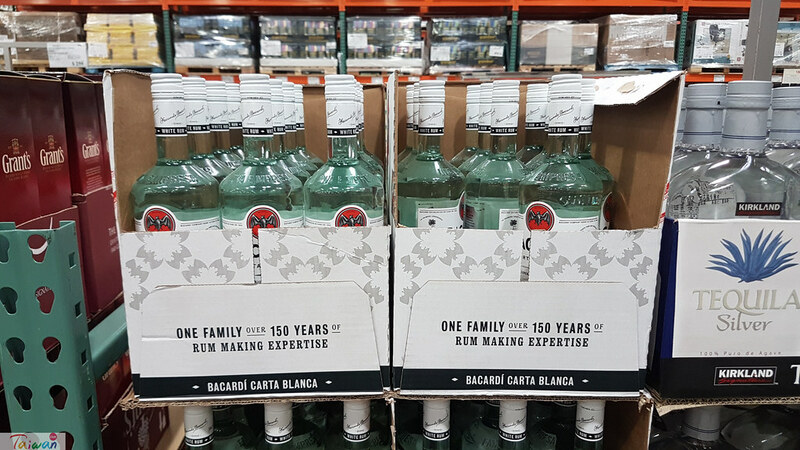 Looks like fun. Great shots and report. Asish, fortunately this one goes pretty slow, plus they have dampeners on the carriages so they don’t swing around. 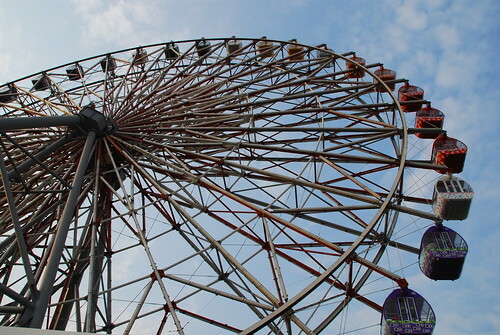 for someone who is afraid of heights this wheel might be easier to take than some others. OK… this is a first for me… seeing a ferris wheel on top of a building. That is very impressive. The view looked GREAT from up there. I don’t think she would want to go on that ferris wheel. She’s told me in the past that she’s afraid of heights. She said she wouldn’t even go to the observation deck of Taipei 101 (which is something else I wouldn’t mind doing after being on the roof of the Fed and to the “indoor” observation levels of the Hancock and the Prudential Towers). 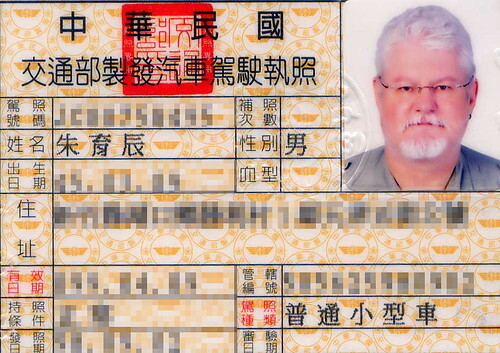 Mike, your coming to Taiwan hinges upon her passing the test? you’d better get packing! 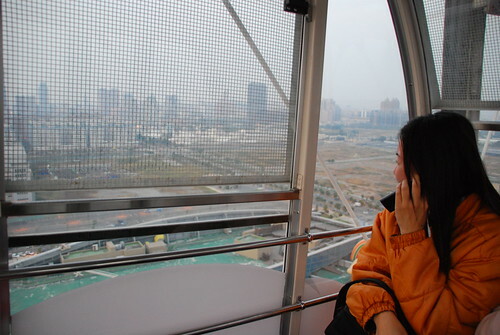 trust me, she wouldn’t go on that ferris wheel because it’s too far away down in Kaohsiung. you’ll soon learn about Taiwanese and travel ;). Well… her exam is on “peritoneal dialysis”… which is a kind of treatment for the kidney failure patients. She did say to me “buy your plane tickets right away” as she’s sure she’ll pass. 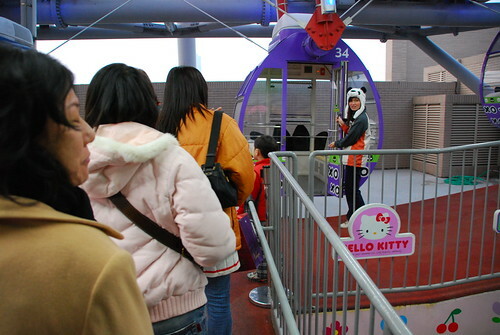 She’s been to Kaohsiung… but not to that mall (it opened on May 12, 2007 according to Wikipedia). 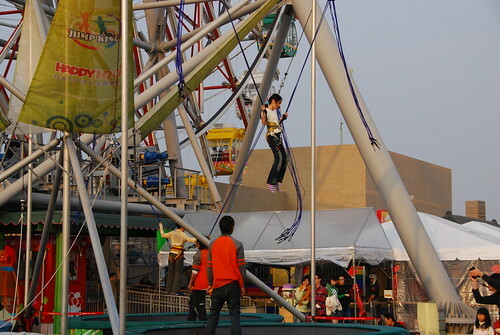 She said there is a huge ferris wheel in Taipei too. Mike, just let me know when you’ll be here. i assume you’ll be staying in Taoyuan, and i have a couple of good friends there who like to party. 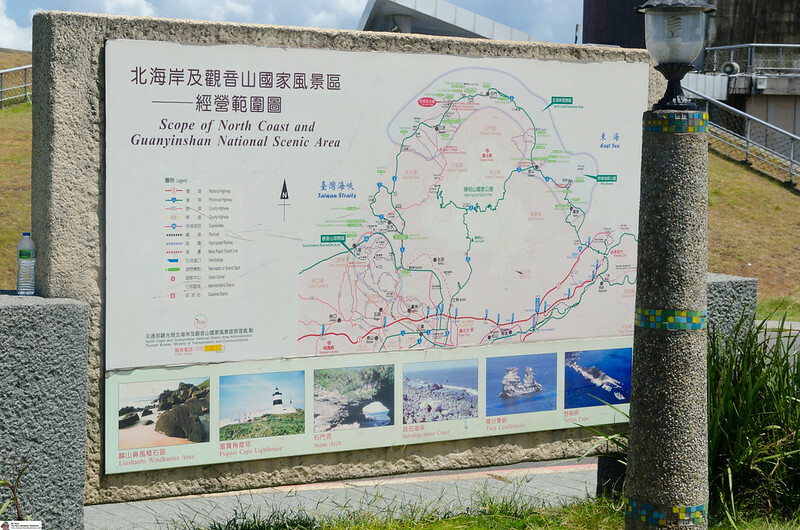 yes, that’s right – Taiwanese complain about traveling for an hour by car. 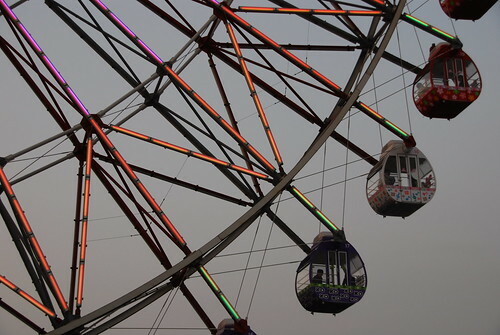 Cool look at the ferris wheel. 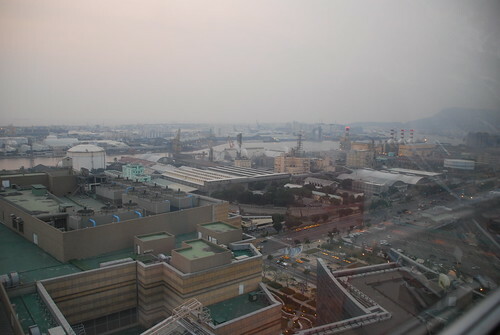 Selina and I passes through Kaohsiung late last week but didn’t think of going there. you guys should have called us! we were looking for something to do! Awesome photo series, MJ. My favorites are second and third from the top. John and I are sorry we didn’t make it down. 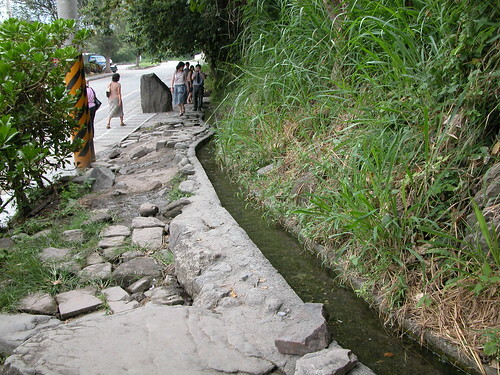 He wanted to drive and after battling traffic to Taichung, we decided not to go any further. It looks like we missed out on a great time. thanks Carrie. i don’t blame John for not wanting to drive down to Kao; the traffic must have been really bad. but i heard John cleaned A-dong out of beef again, so you must have had a good time after all! 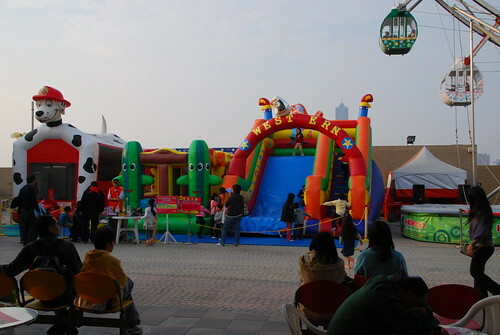 I’ve been to Dream Mall a couple times, most recently during summer 2008. Even then, the mall was startlingly empty. Dream Mall hasn’t been very successful it seems. We thought this summed up the situation fairly well: when Dream Mall opened, they were promoting free parking for several months to generate interest and visitors to the mall. A year and a half later, parking was still free. Andy, if you saw the Dream Mall over the holiday you might not think so. that place was packed! 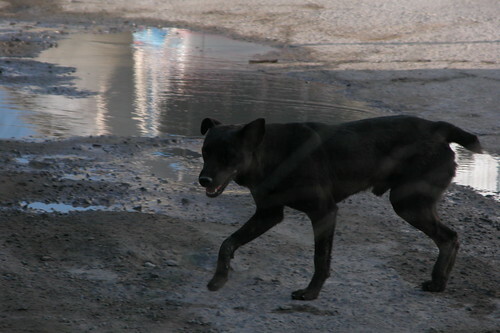 it was difficult to move around in some places because of all the bodies in the way. taking the elevators and escalators was particularly revealing. 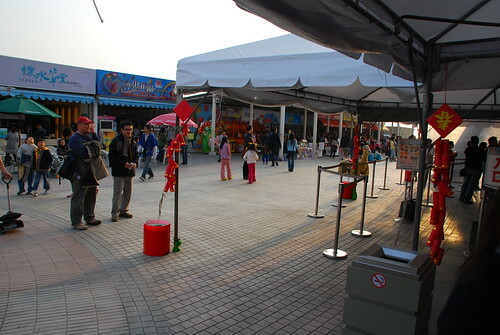 we went there 3 times during the holiday and it was constantly full of people. it sure looked successful to us. Karen’s been wanting to go there for the longest time now!